Fellow explorer of Arborea, you are now about to discover a very important aspect of TERA. Something which we won’t enjoy as there is a lot of Luck involved. That is, if we wish to get the best stats on our gear… the world of Gear Attributes and Upgrading. Now before some people get scared by the idea of RNG, it is not necessary to get the best stats or the highest level of enchanting to do really well in TERA (both in PvP and PvE). However if you wish to be the best, I suggest you read on and try to get the best stats on your gear. During your travels in Arborea you will come across many “enigmatic” items with a “?” over them. Only these “enigmatic” items can be identified, and only once identified can they be upgraded. To identify the item you will need to buy a common identification scroll at the general vendor (costs 5,250 gold). Upgradable items always have base lower stats than non-upgradable items; however their potential is far greater. The reason is that the upgradable items can be identified to reveal specific attributes that will aid you in your numerous battles. In short, attributes are stats which activate when certain conditions are met, similarly to crystals. Once the item has been identified it can be strengthened via the enchanting system. The sacrificial gear you must use depends on the tier of the item you wish to enchant. You can only enchant an item by using a sacrificial item of the same tier. Furthermore the sacrificial item has to be the same type as the item you wish to strengthen. For example, if you try to enchant a weapon you must sacrifice another weapon (any type as long as it is the same tier). The reason why it is called sacrificial item is that it will be destroyed in the process of enchanting your gear. The tier of an item varies depending on the level of the item. Different types of enchantment alkahest (I refer to them as powders, much easier to say and type) can be used, each have their own effect but of course their price greatly varies. The three types are White powder, Pink powder and Blue powder. This part will cover the various attributes that can be found on all equipments. 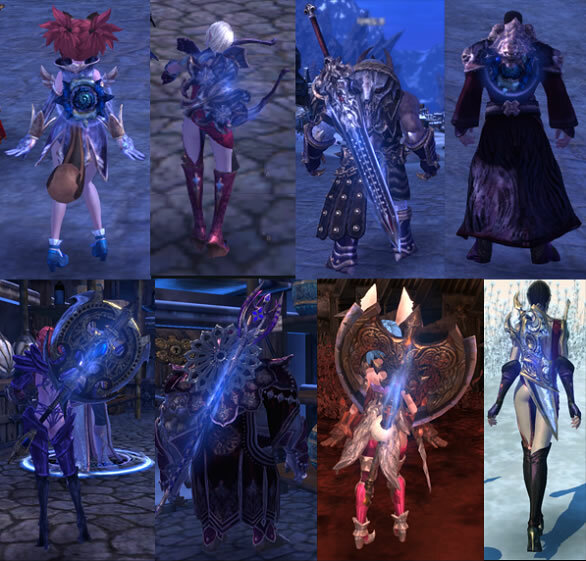 Afterwards I will mention the class-specific attributes which you can get from two level 58 Dungeons (Dome and Watch). Finally I will finish the post by discussing which attributes are the most preferred for the various class roles. This section mainly focuses on the PvE aspect, since for PvP there are less attributes to choose from. I will however add a PvP section if people request it. When there are more than one line of attributes it means you can choose between different options depending on what you prefer. Identifying and making enigmatic is a very simple process, however be aware that randomly generating attributes for your gear can get expensive, since it is random. It is suggested to only start doing so at level 50+. Identifying an item will generate random attributes, some will come into effect straight away while the other attributes will only be reached by enchanting the item. Depending on the type of gear you can get either 1 or 2 additional basic attributes. This means you will feel the effect of those attributes even if you do not strengthen the item. On PvE and Crafted gear you can only generate the same attribute twice; once as an immediate attribute and again as an attribute which is unlocked via enchanting. The only way to get three of the same attribute on you gear is if the attribute is already present as a base stat and you generate two more of the same attribute on top of that. On PvP gear however you can generate the same attribute for all the enchantment levels. After an item has been identified it can be made enigmatic if you wish to generate better attributes which are more specific to your class. To generate attributes which satisfies your requirements you can just keep identifying and unidentifying your gear. This process can become quite expensive and is therefore only recommended once you reach level 50+. In the post above I explained which attributes you may want to focus on getting depending on your class, make sure you have read it. Once you are satisfied with the attributes, or are just tired of trying to get the perfect stats, you will use the enchanting system. As you can see, crafted gear does gain an extra attribute over PvE gear. This is why crafting gear can be a good alternative when leveling up. However at high level it is less viable for various reason (mainly it is very expensive to craft armor that compares to the good drops). Before you attempt to Masterwork your gear you need to be aware of a very important fact, it costs a lot of money. It is recommended to only Masterwork the best gear (currently Level 58 Tier12 Rank1) with this method. Masterworking is when you improve your gear by giving it the potential to be enchanted past the +9 mark. It also increases the effectiveness of the gear, hence raising its base stats and the effectiveness of each attribute. A masterwork item will have a gold medal (get picture) overlay. You will receive random attributes (for example at +3/+6/+9) as always but on top of that you will be able to strengthen the item to +10/+11/+12. The +10/+11/+12 attributes will always be the same depending on the gear type. If it is a Weapon then the +10/+11/+12 attributes will be +3 Strength for each step. If the masterwork gear is a piece of Armour then the +10/+11/+12 attributes will be +2 Defence for each step. The masterwork process is simple, yet painstakingly expensive. You can masterwork gear which is not legendary using the identification and enigmatic method, which is much cheaper than trying to masterwork a legendary item. To get both the masterwork and the attributes on a rare item takes on average 150-800 of each scrolls (depending on the item). To masterwork a legendary item however you have to use a better version of scrolls than those used for the identification and enigmatic process. This is where the intricate identification scrolls and intricate enigmatic scrolls come into play. Again, and I cannot stress this enough, only attempt to masterwork the best gear. On average it takes around 50-100 of each intricate scrolls to get a masterwork on a legendary item. However to get both the masterwork and the attributes many of us will spend most of their money, and more. On average it takes around 150-300 of each intricate scrolls to get both the masterwork and attributes which you are satisfied with. 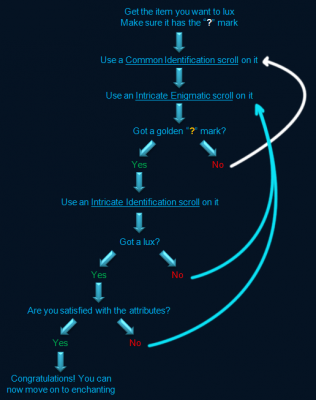 By looking at the flowchart you can see that there is no point of using an intricate identification scroll unless there is a golden “?” on the item. The reason is that statistically speaking the probability of getting a masterwork without first having a golden “?” is approximated at 0.05%. However using an intricate identification scroll on a golden “?” gives approximately a 1% chance to masterwork . Hence this saves you a lot of money in the long run. When leveling up, it is greatly recommended to enchant your gear to +4 in the low to mid levels, no higher as you will get replacement gear fast as you level up. Getting +4 is relatively easy to achieve, with an approximate success rate of 80% from +1 to +4. Past level 45 and above it is more efficient to get +6, as you gain an extra random attribute and you keep your gear for longer. Finally, at max level (58) it is important to get +9 up to +12 on your high-end gear. The obvious reason being that you will keep the gear for many months and the added bonuses will really add up to greatly aid you in your many battles. The number of powders required to enchant the equipment is directly depend on the Tier of the said equipment. If you are trying to enchant a low level item of Tier4 then you will only require 4 powders for an attempt at raising the enchantment level. If you are however trying to enchant the highest level items of Tier12 then you will require 12 powders. The high-end level 58 gear is Tier12 and has various rank that defines the quality. Tier12 Rank1 is the best gear and upgradable while Tier12 Rank6 gear is non-upgradable, but very useful as sacrificial items to upgrade Tier12 Rank3/Rank2/Rank1 gear. Please note that Tier12 gear cannot be traded, it is bound to whomever loots it. As previously mentioned, there are three types of powders: White, Pink and Blue. Their effects are described below:White = Normal success rate, chance to downgrade if failure. Most commonly used powder type as it is very cheap and sold at every general merchant store. Pink = Higher success rate, chance to downgrade if failure. Least used powder type, it is relatively expensive and can still cause the gear to downgrade if the enchantment is a failure. This item is only sold in the luxury shop which can only be enabled by Vanarchs (Lords). Blue = Normal success rate, minimal chance to downgrade if failure. This powder is only used from +6 up to +12, it is very expensive but worth the price. The minimal chance to downgrade means that the gear will almost never downgrade from +6 to +12, although it can happen. This item is only sold in the luxury shop which can only be enabled by Vanarchs (Lords). +0 to +4 = Use Common and Uncommon gear as sacrificial items and White powders. +4 to +6 = Use Rare gear as sacrificial items and White powders. On Tier12 items, I personally use Pink Powders from +5 to +6 as Rare Tier12 gear is the most expensive Tier12 gear which can be traded. +6 to +12 = Use Legendary gear as sacrificial items and Blue powders. 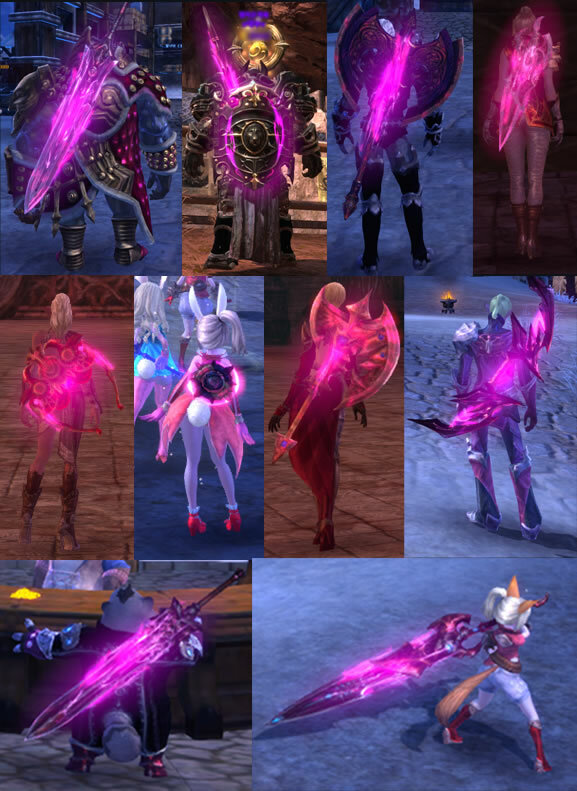 As a side reward for enchanting your weapon to +7 and above you will notice a glow on your weapon. There are different hues, from a faint blue glow at +7 to a full bright neon pink at +12. Thanks for reading this article, and I hope you found it useful. Credit for writing it goes to Deioth from Atra-Astrum guild. Don’t forget to add your own thoughts in the comments below! 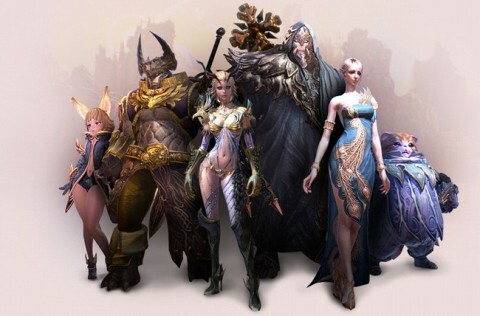 For further information read this Tera Strategy Guide. Highly recommended for all players.